Your eyes will go "wow" when they alight on these large splashy pink and lavender blooms with frilly white edges. 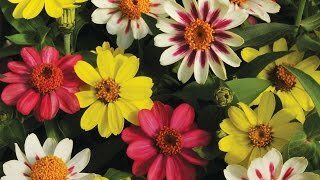 The hardy, easy-to-grow 16" plants flower from June right through September in well-drained soil. The bushy, full-bodied plants light up a border with dazzling color. Gaillardia, Punch Bowl Hybrid is rated 5.0 out of 5 by 3. Rated 5 out of 5 by alohasarah from Beautiful Annual that re-seeded..... We bought the seeds from Burpee. Easy to geminate. Beautiful pink giallardia! Profuse blooms, with no deadheading. About 1/4 the plants were white/cream flowers, not pink, but that was okay with me. The best part, is that the plant re-seeded itself on the dirt it was planted last year...or even grew back from an old plant (because it was growing out of a trimmed dead stalk of last year's flower plant). Love it!! Rated 5 out of 5 by Elmo199 from A Winner For Me Last Season Gaillardia, Punch Bowl graced my yard last year for the first time. It was one of my favorites of the season. Easy Germination, high survival rate and many are doing fine in the light frost too. Rated 5 out of 5 by BurpeeGardenExpert from Beautiful, unique color combination, easy to grow This unique bicolor combination is very different from the common yellow and red combination. The nice, clean, pink-to-lavender blooms are massed on top of clean and easy-to-grow plants.